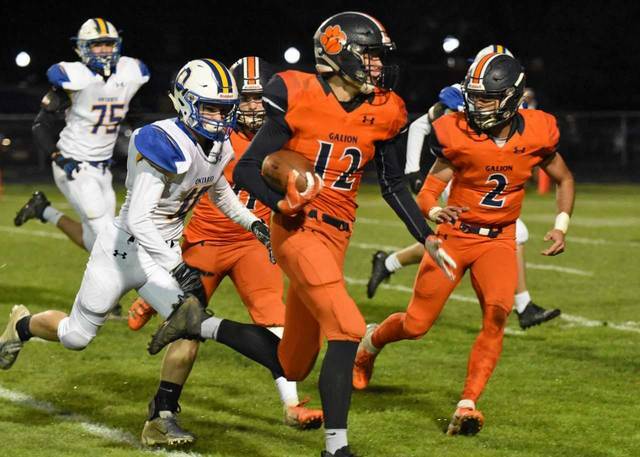 Don Tudor | Galion Inquirer The Galion Tigers' Steve Hoffman chases down Ontario back Noah Creed during week nine MOAC football action. In a cold and rainy contest, the Tigers emerged victorious; 45-21. Don Tudor | Galion Inquirer Gage Lackey secures the ball and runs in the touchdown during Friday's home finale against the visiting Ontario Warriors. Lackey and the Tigers won the contest to improve to 5-4 on the season; 45-21. Don Tudor | Galion Inquirer Isaiah Alsip comes down with one of his five receptions on Friday against Ontario. Alsip caught five passes from quarterback Elias Middleton, resulting in 117 yards in the 45-21 Galion victory over the Warriors. 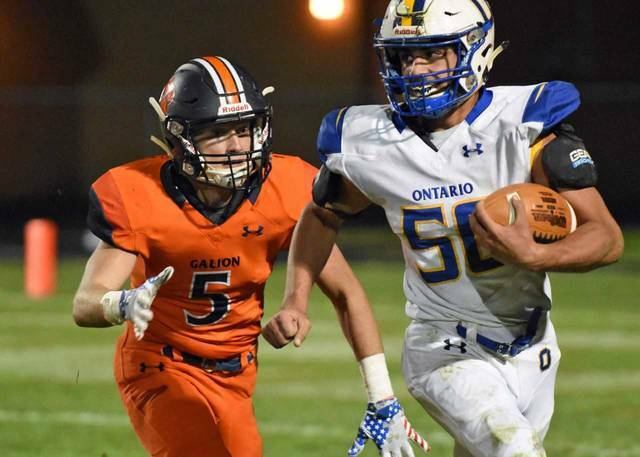 GALION — On Friday evening, the Galion Tigers welcomed the Ontario Warriors to Unckrich Stadium to play in the Tigers’ home finale. Throughout the cold and rainy contest, the home squad would maintain control and a lead to hand the visiting Ontario Warriors a 45-21 defeat. With the victory, Galion improves to 5-4 overall on the season and now sit at 2-4 within the Mid-Ohio Athletic Conference. For Ontario, they fall to 3-6 on the season and 1-5 in league action. In the regular season finale, both Galion and Ontario will be on the road. The Tigers will head to Delaware to face the hosting Buckeye Valley Barons while the Warriors head to Marion for a meeting with the Pleasant Spartans. Galion would score on their first possession of the game when quarterback Elias Middleton took the ball in from four yards out for the score. Dominic Pittman would add the extra-point and with 9:32 remaining in the opening frame, the orange and blue led; 7-0. That score would stand as the only points tallied by the two teams in the first 12 minutes of play. In the second quarter, Pittman would tack an additional three points on the board for Galion thanks to a 43-yard field goal that split the uprights with plenty of distance. However, on the ensuing kickoff, Ontario would bobble the catch but scoop it up and run through the Tigers’ special teams squad for a 90-yard return for a touchdown. After the PAT, it was 10-7 in favor of Galion. That would trigger a momentum shift in the contest as the Warriors would score the next two touchdowns on carries from Noah Creed from nine yards out and a yard out. Both extra-point attempts would be successful and the visitors found themselves up; 21-10. Middleton would stop the scoring run by the guests though, dashing down the field for a 40-yard touchdown run. Pittman hit another PAT and the Tigers pulled within four at 21-17. With just 18 seconds remaining in the first half, Middleton would find wideout Kalib Griffin for a six-yard score and Pittman would boot the extra-point through to put Galion up at the half; 24-21. 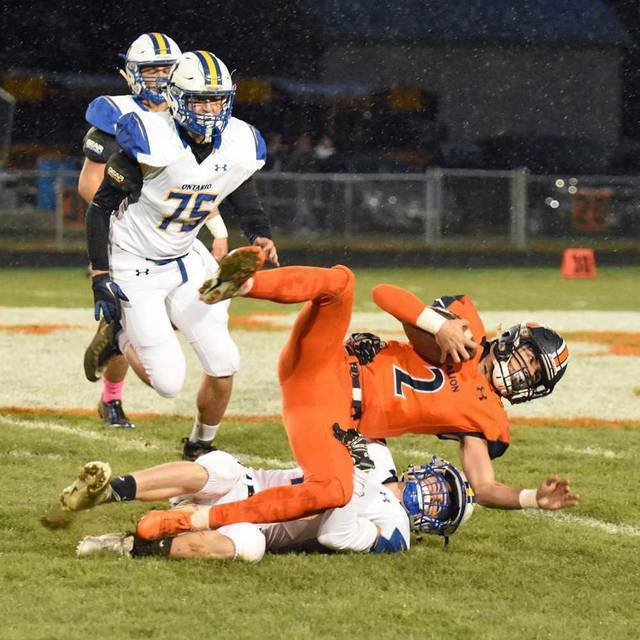 Entering the third quarter, the Galion defense would tighten up and as the rains came down harder, the offense continued to shine, led by Middleton. Less than four minutes in to the second half, the Tigers’ QB would take off for an 89-yard touchdown run while Pittman made it a 10-point lead; 31-21. Middleton would add a one-yard rushing touchdown with under a minute and a half left in the third and Pittman made it 38-21 in favor the the home team. The final points of the contest would occur with 8:22 left in the game as Middleton connected with senior Gage Lackey for a 10-yard aerial strike. Pittman converted yet another PAT and the score found its’ eventual final of 45-21, Galion on top. Galion had the ball for just 20:35 for the game but racked up 473 yards of total offense (169 passing, 304 rushing) to Ontario’s 129, all of which came on the ground. Both teams would commit three turnovers and be heavily penalized as the Warriors recorded 109 yards of penalties on 12 flags. Galion was flagged seven times for 70 yards in the win. Middleton continued to shine as the Tigers’ leader, going 10/17 passing for 169 yards and two scores while also throwing an interception. On the ground, Middleton carried the ball 21 times, resulting in 176 yards and four touchdowns. Hanif Donaldson carried the ball four times for Galion and picked up 66 yards while Colbey Fox gained 60 yards on 13 carries. Alsip was the primary target for Middleton, catching five passes for 117 yards. Lackey finished with two catches for 29 yards and a score. Griffin caught two passes for 23 yards and the second-quarter touchdown. Elsewhere in the MOAC, the Clear Fork Colts (9-0, 6-0) remained undefeated, edging Pleasant (7-2, 4-2); 16-14. Buckeye Valley (5-4, 5-1) continued to surprise the conference, defeating North Union (6-3, 3-3); 31-20. Harding (2-7, 1-5) earned their first conference victory, defeating the River Valley Vikings (3-6, 2-4); 19-18. The Galion Tigers’ Steve Hoffman chases down Ontario back Noah Creed during week nine MOAC football action. In a cold and rainy contest, the Tigers emerged victorious; 45-21. Gage Lackey secures the ball and runs in the touchdown during Friday’s home finale against the visiting Ontario Warriors. Lackey and the Tigers won the contest to improve to 5-4 on the season; 45-21. Isaiah Alsip comes down with one of his five receptions on Friday against Ontario. Alsip caught five passes from quarterback Elias Middleton, resulting in 117 yards in the 45-21 Galion victory over the Warriors.